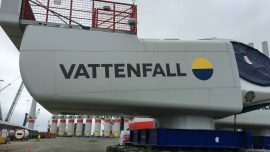 Vattenfall’s 406.7MW Horns Rev 3 offshore wind farm has started delivering power to the Danish grid. Fred. 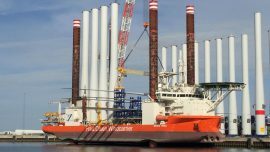 Olsen Windcarrier has marked a milestone in offshore wind turbine installation as it installed the 400th unit. 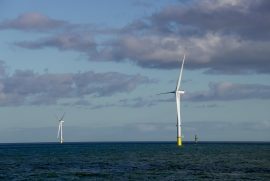 MHI Vestas Offshore Wind and Global Wind Service (GWS) passed a halfway point on the 406.7MW Horns Rev 3 project on 3 November after installing the 25th wind turbine in the Danish North Sea. 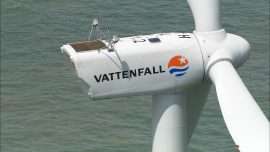 GeoSea has installed all 49 transition pieces on Vattenfall’s 406.7MW Horns Rev 3 wind farm in the Danish North Sea. 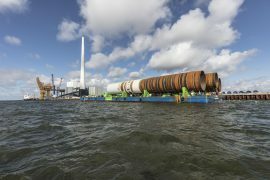 Bladt Industries has shipped off the last four transition pieces built for Vattenfall’s Horns Rev 3 offshore wind farm. 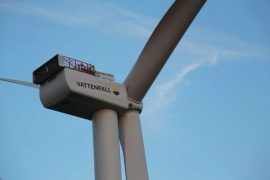 Eight out of 49 MHI Vestas 8.3MW wind turbines have so far been installed on Vattenfall’s Horns Rev 3 wind farm in the Danish North Sea. 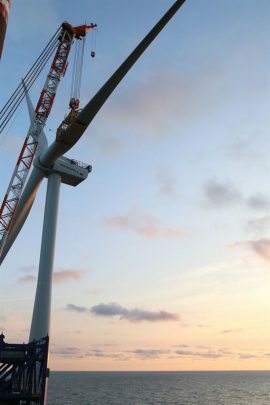 The first MHI Vestas 8.3MW wind turbine has been installed on Vattenfall’s 406.7MW Horns Rev 3 wind farm in the Danish North Sea. Fred. 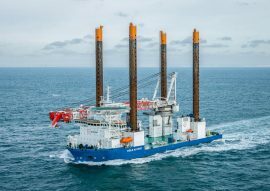 Olsen Windcarrier’s jack-up Brave Tern has left the Port of Esbjerg in Denmark loaded with the first four wind turbines to be installed on Vattenfall’s Horns Rev 3 offshore wind farm in the Danish North Sea. Denmark-based marine contractor Peter Madsen Rederi A/S (PMR) has completed the construction of a new set of stone beds in the Port of Esbjerg for the load-out of turbines destined for the Horns Rev 3 offshore wind farm. 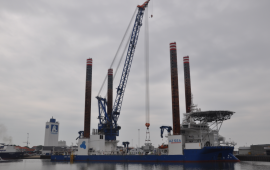 Jan De Nul’s jack-up Vole au vent has arrived in Vlissingen, the Netherlands, to load the first set of transition pieces and install them on Vattenfall’s Horns Rev 3 wind farm in the Dutch North Sea. Fred. 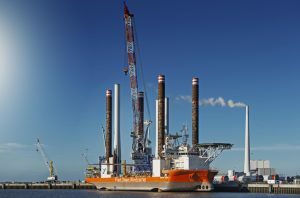 Olsen Windcarrier’s jack-up Brave Tern has arrived in Esbjerg, Denmark, and is loading the first set of wind turbine components to be installed on Vattenfall’s Horns Rev 3 offshore wind farm. 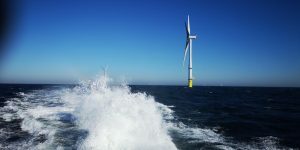 The first transition piece will be installed on the Horns Rev 3 wind farm mid-July, Vattenfall, the owner and developer of the 406.7MW project in the Danish North Sea, said. 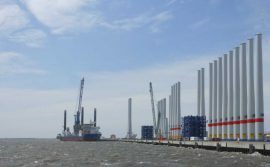 The Port of Esbjerg posted a photo on its social media pages on 2 July, showing 20 wind turbine towers for Borkum Riffgrund II and 14 towers for Horns Rev 3 waiting at the port to be loaded onto vessels and then installed at their respective sites in Germany and Denmark. 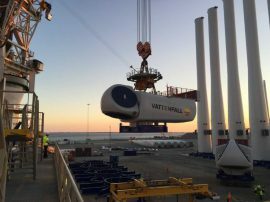 The first nacelle for one of the wind turbines which will spin at Denmark’s Horns Rev 3 offshore wind farm has arrived in the Port of Esbjerg, where the project’s turbine components are waiting for installation that is expected to start in some four weeks. 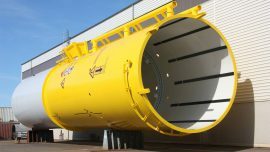 GeoSea has awarded SAL Heavy Lift with a contract for shipment of a total of 49 transition pieces for the Horns Rev 3 offshore wind farm in the Danish North Sea. GeoSea’s heavy-lift jack-up Innovation installed the 49th and final monopile on Vattenfall’s Horns Rev 3 offshore wind farm in the Danish North Sea just after the New Year. 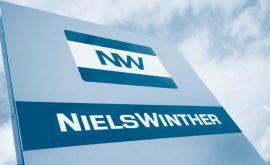 VBMS has contracted Niels Winther Shipping as the preferred supplier of agency services for the 406MW Horns Rev 3 offshore wind farm located in the Danish North Sea. 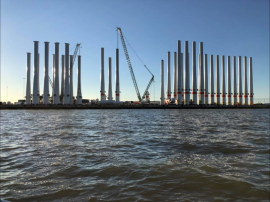 GeoSea’s offshore wind installation vessel Innovation has installed the second batch of monopile foundations at the Horns Rev 3 site and returned to Port of Esbjerg today to pick up the next four, a spokesperson from Vattenfall confirmed to Offshore WIND. GeoSea’s installation vessel Innovation has transported the first set of monopiles for Vattenfall’s 406MW Horns Rev 3 offshore wind farm from the Port of Esbjerg in Denmark. 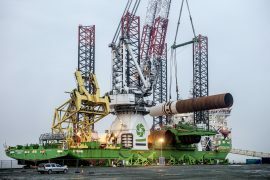 The first four out of the total of 49 monopiles have been installed at the Horns Rev 3 offshore wind farm site in Denmark and GeoSea’s installation vessel Innovation is now set to install the next batch. The first monopile foundations have been scheduled for shipping from the Port of Esbjerg to the site of Vattenfall’s 400MW Horns Rev 3 offshore wind farm on 9 October. 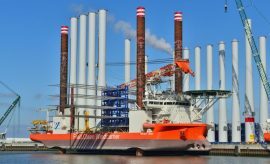 Blue Water Shipping (BWS) has won the port logistics contract for Vattenfall’s 400MW Horns Rev 3 offshore wind farm in the Danish North Sea. 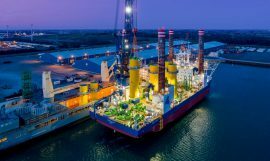 Norway-headquartered engineering and consulting company Head Energy has secured two offshore wind agreements with the Swedish energy company Vattenfall for the 406.7MW Horns Rev 3 offshore wind farm in Danish North Sea.